Senator and 2016 Democratic hopeful blasts Israel for defense of Gaza border, says Israel should be condemned for rioters' deaths. 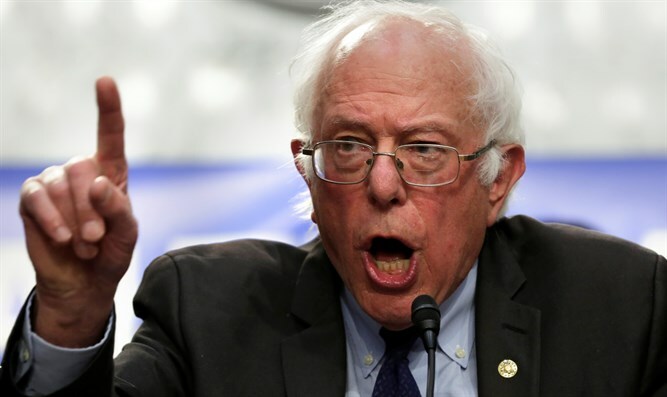 Vermont Senator Bernie Sanders condemned Israel over its use of force to defend its border with Gaza against Arab rioters earlier this week and slammed President Trump’s support for Israel’s behavior. Speaking with The Intercept on Tuesday, the 2016 Democratic presidential hopeful and Socialist senator blasted President Trump for withdrawing the US from the 2015 Iran nuclear deal, saying it would likely set the US on a path towards war with Iran on behalf of Saudi “multi-billionaires”. Sanders also hit the Trump administration over its support for Israel’s right to self-defense against riots and attempted terror attacks along the Israel-Gaza frontier. "Innocent people are being killed,” said Sanders, after roughly 60 rioters were shot dead on Monday during clashes next to Israel’s security fence on the Gaza border. "Those are terrible actions," Sanders said. "Instead of applauding Israel for its actions, Israel should be condemned. Israel has a right to security, but shooting unarmed protesters is not what it is about." On Monday, approximately 60 Arab rioters were killed after tens of thousands converged on the Israel-Gaza border in a series of violent protests dubbed the “March of Return”. Rioters hurled firebombs and flaming tires at soldiers, while some attempted to breach Israel’s security fence along the Israel-Gaza frontier. Security officials say 24 of the rioters killed on Monday have been identified as Hamas terrorists.